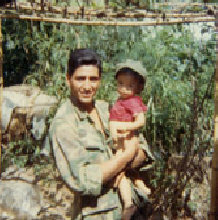 No matter what part of Phu Da Chalio was in, he would always be found holding a child. This scene is what the Marines saw leaving Phu Da's back gate. 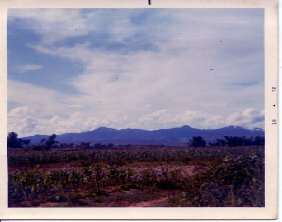 The group of trees on the two sides of the picture were a favorite ambush site of the Communists. The tree lines were loaded with booby traps and mines. The Communists hid in underground holes and bunkers. Since the Marines were responsible for security in and around the village, the Americans were forced to move between the two tree lines and get caught in the crossfire. Many times, the peasants working in their fields would warn the Americans of a pending ambush. 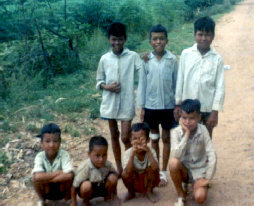 If the Americans were in Phu Da doing their work details or just resting in a peasant hut, kids were sure to be nearby. The seven boys above ran errands, shopped in the market place, interpreted, cooked C Rations, massaged tired muscles for the Americans. 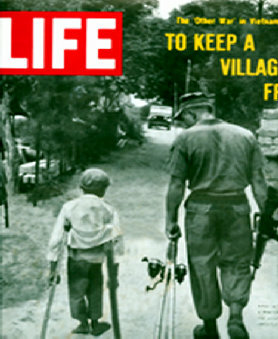 Each Marine used his own village boy and usually rewarded him and his family with money, food, clothes, candy and shared friendships. 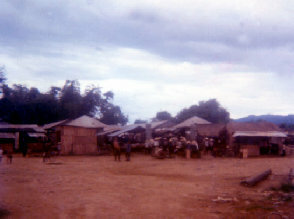 The Phu Da market place. Anything from cold Cokes to crushed Maggot sauce was sold in the simple wooded and tin selling stalls. The hut on the right was where the Americans stopped off for their cold Cokes after a patrol in the heat of the day. The name of the shop was "Co Moi's." It was named after the young woman who owned the shop. 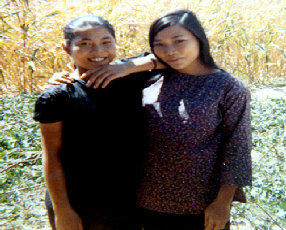 Since there was no electric at all in the village, the ice was bused into the village everyday from Da Nang by a local Vietnamese merchant. At the time, the Vietnamese didn't know the benefits of soap. After a two hour patrol, under 100 degree temperatures, carrying about thirty to fifty pounds of equipment, the American teenagers drank from fifthly glasses. It wasn't unheard of for a Marine to drink 4 or 5 cans of Coke in one sitting. At a dollar a can, everyone ran up a tab. On the American payday, Co Moi had a smile on her face a mile wide. She probably made more money in a month than most Vietnamese farmers made in an entire year. 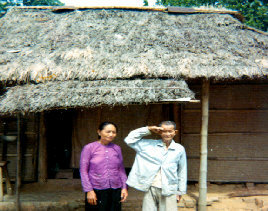 A Phu Da elder and his daughter. Out of respect, the Americans always called him "The General." By his voluntary pose, it is easy to realize that the respect was mutual. Press your favorite above picture for more pictures.